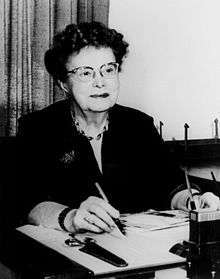 Ethel Percy Andrus (September 21, 1884 – July 13, 1967) was a long-time educator and the first woman high school principal in California. She was also an elder rights activist and the founder of AARP in 1958. In 1995 she was designated a Women's History Month Honoree by the National Women's History Project. She earned a bachelor of philosophy (S.B. or Scientiæ Baccalaureus) degree from the University of Chicago in 1903 and a bachelor of science degree from Lewis Institute (now Illinois Institute of Technology) in 1918. She then went on to receive her master's (1928) and doctoral (1930) degrees from the University of Southern California. While teaching at the Lewis Institute, she volunteered at Jane Addam's Hull House. Andrus founded a separate organization, the National Retired Teachers Association (NRTA) in 1947. She realized that retired teachers were living on very small pensions, often without any health insurance. She approached more than 30 companies to offer health insurance to retired teachers, before she found someone willing to take a chance on NRTA members in 1956. The organization expanded its membership to all retirees and became AARP in 1958. In 1954 she moved to Ojai, California, to start Grey Gables of Ojai, an NRTA sponsored retirement community. She ran both NRTA and AARP from her offices in Ojai until 1964, when she moved the administrative branch of AARP to Long Beach. It was while living in Ojai that she founded AARP in 1958. Today, the NRTA is still a division of AARP, and serves as its educator community. The Ethel Percy Andrus Gerontology Center is named after her at the University of Southern California Leonard Davis School of Gerontology, the oldest and largest existing professional school of Gerontology. Among Andrus' many accomplishments is a stint as a faculty member at Chicago's Lewis Institute, a predecessor of Illinois Institute of Technology and the first woman high school principal in the state of California. She was inducted into the National Women's Hall of Fame in 1993. She is buried at Ivy Lawn Memorial Park in Ventura, California. ↑ "Ethel Andrus (1884 - 1967)". Biography. National Women's History Museum. Retrieved 14 November 2011. ↑ "Honorees: 2010 National Women's History Month". Women's History Month. National Women's History Project. 2011. Retrieved 14 November 2011. ↑ Ohles, Frederik; Ohles, Shirley M.; Ramsay, John G. (1997). Biographical dictionary of modern American educators. Greenwood Publishing Group. p. 9. ISBN 0-313-29133-0. OCLC 36430647. Retrieved 2009-03-25.